Peace and grace to all of you in Jesus Great name! Periodically I find an article by another author that I realize says it all and I could not do a better job. This weeks article is about truth. I have received permission to reprint the article listed above written by a well known author by the name of Joseph Farah. Further I sincerely recommend that my readers subscribe to this mans work. If you really want to know how important the Temple Mount in Jerusalem is to the Muslims/Islam this article will tell the tale. You’ve undoubtedly heard that Jerusalem represents the third holiest city in Islam. Or, perhaps you’ve read in Wikipedia or heard on CNN that the Al-Aqsa Mosque is the third holiest place of worship in Islam. That, too, is a provable lie. Before I get to the history of these myths, these aberrant legends, these anti-Semitic fictions from hell, let me tell you why anyone with a clear head and objective, rational mind can see the truth in spite of the powerful delusion that has cast a spell upon the world – deliberately, with political purpose and very recently, too. Everyone should recognize the No. 1 holy site in all Islam is Mecca, the Qaba, which draws millions of pilgrims annually – perhaps more than any other religious shrine in the world. For instance, while some 5 million visit the Vatican City every year, 18 million Muslims visit Saudi Arabia and, almost all of them, go to Mecca, which doesn’t allow non-Muslims to enter the city. The annual five-day Hajj, alone, attracted more than 2 million in 2017. Spiritual pilgrimages are a big deal in Islam, and the No. 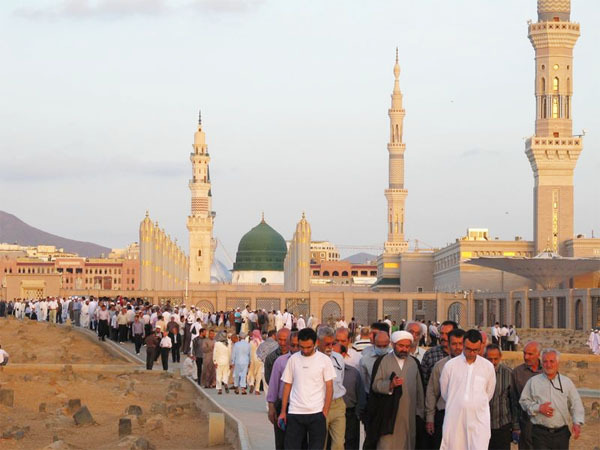 2 holy site in all Islam is probably Medina, where Muhammad is buried. 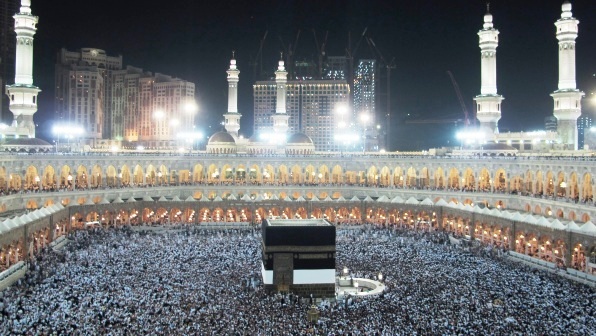 But after Mecca and Medina, there is actually much dispute, even among Muslims, as to which would be Islam’s third holiest city. Why? Because while Mecca and Medina are considered holy to all Muslim followers of Muhammad and Allah, not all of them are Sunni. Sunni Islam adherents represent about 80 percent, or roughly 1.2 billion Muslims worldwide. But another 20 percent are Shia, representing as many as 300 million. And Shia Muslims revere shrines in two other cities in Iraq – Najaf and Karbala. 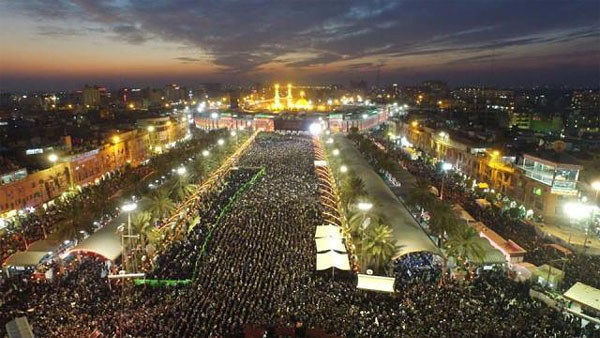 How many make pilgrimage from Najaf to Karbala annually during the Shia Arba’een Pilgrimage? Hold on to your burqa or keffiyeh. Some accounts put it at 30 million from as many as 40 countries, often braving attacks from Sunni terrorists and usually traveling barefoot. That’s right. This Arba’een Pilgrimage, is a much longer one than the five-day Mecca Hajj and, according to many sources, much larger in sheer number of participants. Now let’s consider Al-Aqsa and the Dome of the Rock and Jerusalem. How many Muslims make pilgrimage to Jerusalem? Israel hosts a total of about 2 million tourists from all over the world every year, but only a tiny fraction are Muslims. Israeli tourists are diverse ethnically but almost all Jewish and Christian. And please don’t tell me Muslims are not welcome, because they are. In 2014, the latest statics I could find, showed 26,700 tourists from Indonesia; 23,000 from Turkey; 17,700 from Jordan; 9,000 from Malaysia and 3,300 from Morocco. And those were the biggest numbers. And maybe you think Muslims stopped coming to Jerusalem, their “third holiest city,” after Israel reunified it in 1967. Quite the opposite. There was scarcely any interest in Jerusalem when Jordan controlled Al-Aqsa and the Dome of the Rock. Even King Hussein never visited Jerusalem during the time he controlled part of the city for two decades. If you want to go back further, before the first Zionist Aliyah, you can see what the Dome of the Rock circa 1875 looked like – abandoned, in total disrepair, unvisited. In fact, it didn’t get its famous gold-plated roof until the 1950s under Jordanian control, and it had to be redone in 1993 under Israeli authority. While we’re starting to travel back in history, let’s look for Jerusalem in the Quran. Let me save you some time. You can stop looking. You won’t find it. It’s not there, though a passage we read in the Quran did indeed inspire the building of Al-Aqsa. The Muslim “claim” to Jerusalem is based on what is written in the Quran in Sura 17:1, which says, “Glory be unto Allah who did take his servant for a journey at night from the Sacred Mosque to the Furthest Mosque.” How did this “Furthest Mosque” become the one visited by Muhammad in a dream in which he rode a flying camel or horse? In Muhammad’s lifetime, Jerusalem was occupied by the Byzantine Empire. While Muhammad died in 632, Jerusalem was captured by Muslims in 638. When they came, of course, there was no mosque and no Dome of the Rock anywhere in Jerusalem, only churches. One of those churches is believed to have been built atop the Temple Mount. It may have even been converted into the Al-Aqsa Mosque. In fact, both the dome and the mosque display undeniably noticeable Byzantine architectural influences. When rivals of Muhammad’s successors captured Jerusalem from the Christians, they first built the Dome of the Rock, a shrine the conquerors believed to have been the site of the Second Temple, destroyed by the Roman Empire in 70 A.D. 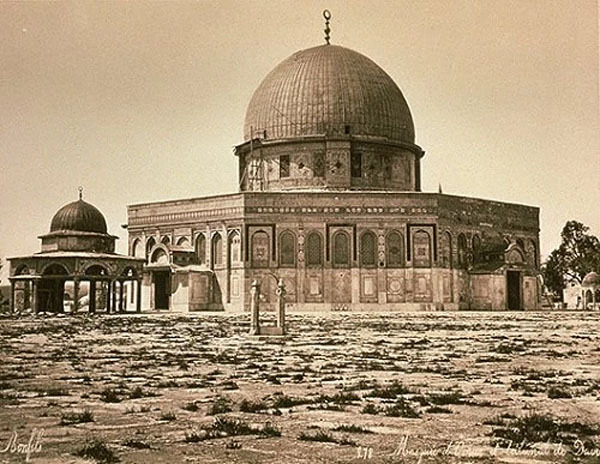 The dome was completed in 691 and the Al-Aqsa Mosque some 20 years later, or some 80 years after the death of Muhammad. The “ascension” of Muhammad from the rock under the dome is believed to have been conjured during this period by Khalif Omar, who sought to construct a new holy site to rival the one in Mecca. Nevertheless, the idea of establishing this shrine and the Al-Aqsa mosque atop the old Temple Mount as permanent Islamic holy places did not catch on, as we can see by comparing them to others in Mecca, Medina, Najaf and Karbala. In fact, not through the entire time of the Islamic Ottoman Empire, which controlled Jerusalem until World War I, and not until 1929, did the Dome of the Rock and the Al-Aqsa Mosque stir any passionate interest in Islam. And that was thanks to Adolf Hitler’s Muslim friend, Haj Amin Al-Husseini, the grand mufti of Jerusalem, who reminded his radical followers of Muhammad’s “Night Journey.” He stoked the myth to initiate riots that year. Then, another dreamer, after the 1967 Six-Day War in which Israel reunified Jerusalem under its control, Yasser Arafat, used the shrines to stir Islam’s claim to the city, which he called “Al-Quds.” Arafat also launched the lie that no Jewish Temple ever rested atop the Temple Mount, though that is precisely why both the dome and the mosque were built there on what Omar believed to be the Temple’s very foundation. On one level, the propaganda coup has fooled most of the world – to such an extent that most Muslims believe the Al-Quds myth. They riot for it all over the world. They commit terrorism in the name of “liberating” it. They boycott, divest, impose sanctions, throw stones, launch missiles, start intifadas and more. But, one thing they don’t do? They don’t visit. They don’t do pilgrimages. Go figure. Thanks again to Mr. Farah for this most excellent article. P.S. My ministry of PSI receives no royalties for printing Mr. Farah’s article. We are doing so here simply because he is an excellent author and is telling the truth. ← ISRAEL, Apple of God’s eye—what does that mean?